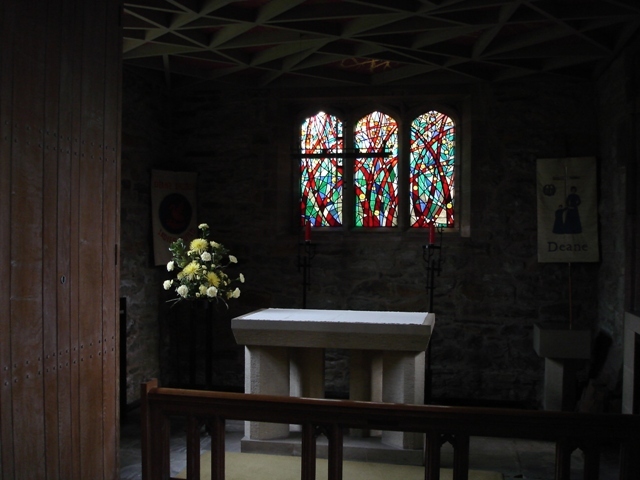 This window in the east wall of the Chapel is modern stained glass. It was designed by Mr. G. Pace of York, who was also the architect of the Chapel, which was dedicated in 1976 by Canon K.M. Bishop (Vicar of Deane 1950-1974). The window was given by Mr. & Mrs. M. Crook in memory of their parents. Mr Pace indicated the theme of the window as tongues of fire leaping upwards. Work on the modern altar table and chapel date from the period 1969 - 76 and were made possible by the relocation of the organ. We use it mainly for an overflow at Holy Communion, and a photogenic place for the signing of the registers at weddings.